Here is a brief description of what has been happening in The Alive with Clive Top 20. To see the latest rankings as of August 9, 2011, click here. 1. Irena Hart has now overtaken The Melillo Brothers (Anthony, Nick and Joe) to move into the # 2 position on The Chart. 2. Joe Venice, Kylie Edmond, Dan Sheehan, Allison Scola and Lisa Redford, have all retained their positions, four through eight, on The Chart. 3. Scott Krokoff is now in 9th position. 4. Robert Randall is at # 10. 5. Thanks to regular, consistent and disciplined voting on a daily basis over the past several months, Tamra Hayden, has emerged from nowhere to quietly leapfrog over several other contenders and move into 12th position on The Chart, behind Jason Gisser and in front of Lisa Bianco. As a new entrant into The Alive with Clive Top 20, Tamra has caused Alex P. Taylor, whose song, “Window,” is the 19th song in The FIRST Alive with Clive Top 20, to lose his position in The Alive with Clive Top 20. 6. Joe Travers, Jeneen Terrana, Scott Urgola, Cassandra Kubinski and Jessica Labus now occupy positions 14 through 18. 7. Daniel Angelus has moved into slot # 19 ahead of John Taglieri. 8. Votes for Jo Williamson have been accumulating in recent weeks, and if voting for her continues it won’t be too long before she finds herself in The Alive with Clive Top 20. 9. Among recent guests on Alive with Clive, an initial spurt of votes for Celadon Candy subsided. There have also been more than a dozen votes for Lindsay Dragan and Shelly Bhushan. To see other clips from The Alive with Clive TV Channel on YouTube, click here. As you will see from Tamra’s Web site at http://www.tamrahayden.com, she is a dynamic performer with a diverse and varied background. She has performed on Broadway as Cosette in Les Misérables and in Texas in Cabaret at Studio 54. Chosen as one of the “Top Ten to watch in 2010” by CDBaby soon after the release of her newest CD, I Believe In The Fire, Tamra is also an accomplished singer/songwriter who has produced two other CDs: A Day At The Fair, and Unwrapped, as well as a music video of her song, “Eden Will Bloom.” In short, she is constantly sharing her immense musical talent with the world in a multitude of different ways. I am honored that she is now in The Alive with Clive Top 20, heading for the Top 10. While I’ve had to suspend promotion of The FIRST Alive with Clive Top 20 to address a major health challenge in recent months, I am now slowly but surely being restored to optimum health and regaining momentum, and will be implementing several ideas to focus attention on The FIRST Alive with Clive Top 20 soon. As a result, interest in The Alive with Clive Top 20 is likely to intensify. Although it will be a while before The SECOND Alive with Clive Top 20 compilation of songs will be released, after more singer/songwriters who have been interviewed on Alive with Clive begin to appreciate the benefits of being in The Alive with Clive Top 20, voting to gain entry into The Alive with Clive Top 20 is certain to escalate and become much more robust. 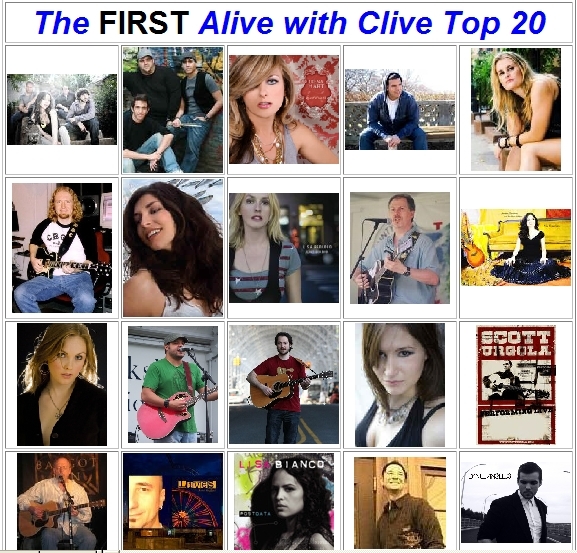 Right now, 129 singer/songwriters who have been interviewed on Alive with Clive are eligible to be in The Alive with Clive Top 20. Serotonen at # 1 has 6,066 votes, Robert Randall at # 10 has 569 votes, and John Taglieri at # 20 has 255 votes. Experience has shown that once a singer/songwriter makes up his or her mind to be in The Alive with Clive Top 20, with the support of family, relatives, friends and fans it doesn’t take that long for him or her to generate the votes necessary to gain entry into The Alive with Clive Top 20. Since the threshold to make it into The Alive with Clive Top 20 – at 255 votes – is so low, I predict that soon some new names and faces will emerge, and that in turn will cause some familiar names and faces to lose their place in The Alive with Clive Top 20 unless voting for them resumes. That, then, is a brief account of what has been occurring with The Alive with Clive Top 20. Stay tuned for more updates in the weeks ahead! 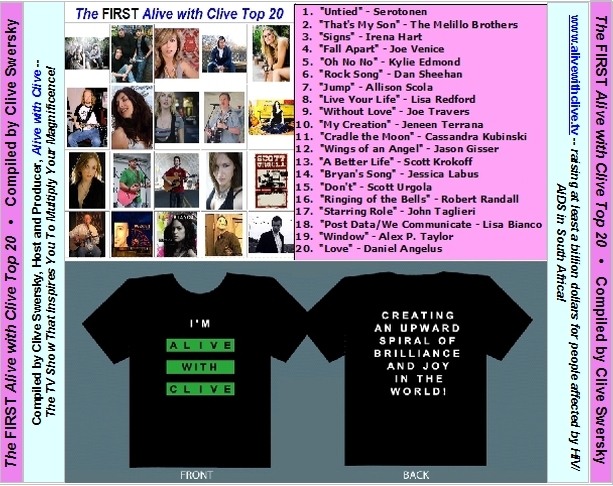 To vote for your favorite musician or band to be in The Alive with Clive Top 20, click here. Be on the lookout for my next Blog post, since I’m about to introduce an exciting new enhancement to The Alive with Clive Top 20! This entry was posted in Alive with Clive Top 20 and tagged A Day At The Fair, Alex P. Taylor, Alive with Clive Global Community, Allison Scola, Bronze Member, Cabaret, Cassandra Kubinski, CD Baby, Celadon Candy, Cosette, Dan Sheehan, Daniel Angelus, Eden Will Bloom, I Believe In The Fire, Irena Hart, Jason Gisser, Jeneen Terrana, Jessica Labus, Jo Williamson, Joe Travers, Joe Venice, John Taglieri, Kylie Edmond, Les Miserables, Lindsay Dragan, Lisa Bianco, Lisa Redford, physical copies, Robert Randall, Scott Krokoff, Scott Urgola, Serotonen, Shelly Bhushan, Studio 54, Tamra Hayden, Texas, The Alive with Clive Global Community, The Alive with Clive Top 20, The Alive with Clive Top 20 Chart, The Alive with Clive TV Channel on YouTube, The FIRST Alive with Clive Top 20, The Melillo Brothers, The SECOND Alive with Clive Top 20, Top 10 To Watch in 2010, Unwrapped, vote, votes, voting, Window. Bookmark the permalink.